How Center Pivot Irrigation Systems Can Increase Crop Yield! | ATS Irrigation, Inc. The primary goal of every farmer growing crops is to increase crop yield as effectively and efficiently as possible to reduce cost per acre. One way to do that is by installing a center pivot irrigation system so long as the center pivot system is set up correctly for the conditions of that crop in that field. The formula for increased yield with lowered costs is the right installation combined with regular irrigation system maintenance to keep things working efficiently. One of the main reasons why growers who use center pivot irrigation systems fail to generate as much yield as they could is poor system design and setup. There is more to the installation of center pivot systems than just connecting enough pieces so the system can span an entire field. Crop Type - Design the sprinkler system to deliver water in a highly efficient way for maximum absorption. This can mean using extended sprinkler heads that hang down into the plants to reduce evaporation and wind loss as well as to ensure that water actually reaches the ground when sprinkling taller plants. Field Shape - Get into corners of square or oddly-shaped fields with the right extension components and sprinkler programming. Variable rate systems are helpful in these situations for getting water to the corners without wasting it the rest of the way around the circle. Sprinkler Overlap - Overlap is essential to prevent field streaking, those lines of plant loss between sprinkler rows due to too much space and not enough overlap between sprinkler heads. Adjustments should be made to accommodate using the sprinkler heads higher to spray entire plants or lower to spray closer to the ground, all of which increases and decreases overlap, respectively. Correct center pivot irrigation system design and setup is only the first part of the equation to get higher yields with less waste; the other part is providing necessary irrigation system maintenance to keep the system working evenly and efficiently. While incorrect sprinkler overlap is one of the major causes of field streaking, a second common cause includes issues with the system itself primarily in the form of plugged sprinkler heads. Keeping the sprinkler heads and lines clean and free- flowing is essential for uniform water delivery, making it a high-priority maintenance task for any center pivot system installation. 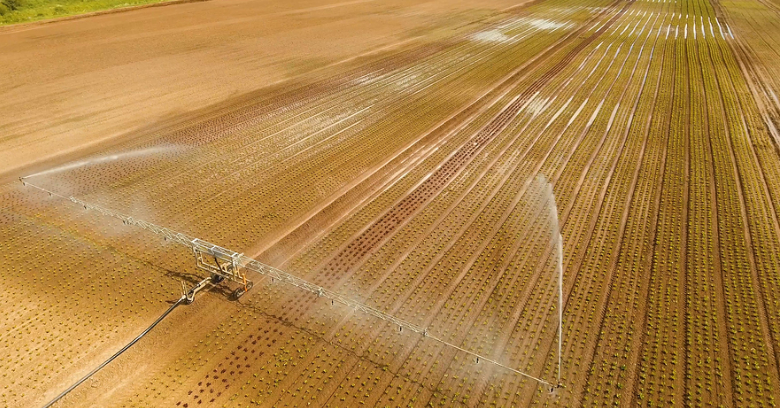 One of the best things about today’s more advanced center pivot irrigation systems is how easily they can be customized to any field and plant to serve your irrigating needs. Unless you take advantage of that ability to customize for your specific needs, you may not get the yield you expect from your center pivot system installation. Along with regular irrigation system maintenance to ensure even delivery, you’ll get maximum system results when you configure it for each growing cycle to accommodate your individual plant, field, and climate specifics! Need Center Pivot Irrigation In Brenham Texas? ATS Irrigation Provides Irrigation System Installation! Call (855) 366-9237 for More Info!